I recently met with a new owner of the SawStop, and took them through some of the specifics of the machine, including some of the basics of safe operation of a tablesaw. As they were an experienced operator, the focus was certainly around the brake mechanism. Six months later, and I get a call. Turns out the SawStop mechanism got tested for real. Scared the bejesus out of him – not only when it activated, but more fundamentally, that it happened at all. So we are going to have another session, and this time running through the A, B, Cs of tablesaw use. Had my own experience last weekend. Not of the SawStop mechanism, but a reminder of basic safe operation. I try to ensure that I am not standing directly in line with the blade when it is cutting. That isn’t always possible, but it is a good practice, and this time was no exception. I was standing to one side while ripping a piece of timber, and a piece of the offcut splintered from an unknown internal fault in the timber. It got spat out by the blade, and sailed right past my ear. Close enough for me to hear it pass by. Close enough that I felt it brush the ear. Reinforces why I like standing to one side while cutting! Even if it had hit, it is unlikely to have done any damage, but it is a good reinforcement why we practice safe use. And why eye protection is mandatory. I finished off the cut – nothing wrong there, so the technique was fine. It really came down to a weakness in the timber. As much as I was out of the line of fire, it was a full-depth cut. And while having the riving knife fitted helps protect against kickback, having the full dust guard fitted when it was appropriate for it to be used would have prevented this happening at all, at least as far as having a small missile launched in my general direction goes. Episode 104 Stop the Saw! First, apologies to those who have emailed me about the TS10L – sorry that I haven’t gotten back to any of you as yet. I haven’t seriously investigated what it is worth – new it would be around $3000+. It is significantly superior to the TSC10HB, both in function and build quality (not that I am saying the TSC10HB is necessarily a bad tablesaw!) It has 52″ rails, left tilt, biesemeyer fence, quick release low profile fence, weighing 220kg. Arbor lock for ease of blade change, and dado blade capable (18mm or so capacity) (not to mention the power to drive one easily). I’m not removing the extra insert to the right of the table, ready for a router on a router mount to be dropped straight in. It has an impressively small amount of runout – a really accurate machine. Anyone wanting to have a look before deciding if you seriously want it are welcome (and encouraged)-I prefer to know you are confident in what you are buying! You can also see the saw throughout this site obviously, including videos. Offers are welcome, as are questions. The shed is now a legitimate, legal, completed (as far as construction is concerned) structure. w00t! There is one item left on the original list – an opening. Let me get my house in order (and by that I mean the shed), machines and tools moved in, mezzanine area finished (which won’t take much over this weekend), and then we will talk. It won’t be one of those Facebook free-for-all parties, but I’d like to show my regulars (if interested of course) the place. I’ll have the SawStop up and running then too, and I do have a spare brake and blade………. and I’m sure a banger could be coerced into jumping into the blade! Should do it reasonably soon while it is still BBQ weather, and I do have some items I need to find new homes for, including my awesome TS10L 10″ tablesaw, a Router Master, and perhaps even a Jet Midi Lathe. Got another update today, with the order being placed with the manufacturing factory today, and with a bit of encouragement we have a 3 week deliver to site. That means (barring some minor manufacturing issues), delivery to site on December 2. With a bit more manipulation, I’d hope to have construction starting either later that week, or at the start of the next (depending on what job the erectors are doing, and how soon after the 2nd it will complete, and the infamous weather). And as a separate (but not entirely unrelated) bit of news, I have been chatting with I Wood Like (Gabbett Machinery) (they are holding my saw until I am in a position to receive it), and it is going to be relocated to their Melbourne factory ready for delivery. As much as I’d like it sooner, there really isn’t an option but to wait for the shed to be ready. For those playing at home, it is the SawStop Professional 3HP. It has the full biesemeyer rip fence, 52″ rails with the additional table infill. About the only thing I need to confirm is whether the blade guard comes with a dust extraction port, or if that is an upgrade (and how much that upgrade would be). (Update – comes with the machine – the other guard I saw is for the contractor’s saw (I saw a saw, and saw the saw was sure not to saw and make you sore)), So final price is $4004, although I will probably want to add a few extra bits to that – another insert so I can cut it for dados, and the dado brake at this stage. Going to be a busy christmas getting all this organised, and the shed itself obviously! At least I have some pretty firm dates to work with – that makes a world of difference. Although I put up the small storage shed last weekend, I really didn’t get a chance to actually make use of the space. Today, I had a crack at trying to sort out the garage (where the majority of my machines are stored). For a while it didn’t seem to be going particularly well – too much stuff, not enough storage, but slowly, slowly, things began to fall into place. In the end, the 8m3 shed was filled to the brim – I would struggle to fit anything more in there at all. And once I got that much stuff out of the garage, it was just sufficient to provide sufficient flexibility to move things around. As far as the decision to go with a shed rather than using a storage unit – I am storing pretty much all that I intended to, and now I’ll have a shed to show for it after the 2 months is up (the intended time I thought I’d need the unit). If it happens to be more than 2 months (every chance the way things always go), then I’ll be ahead on the cash stakes. Money for jam. 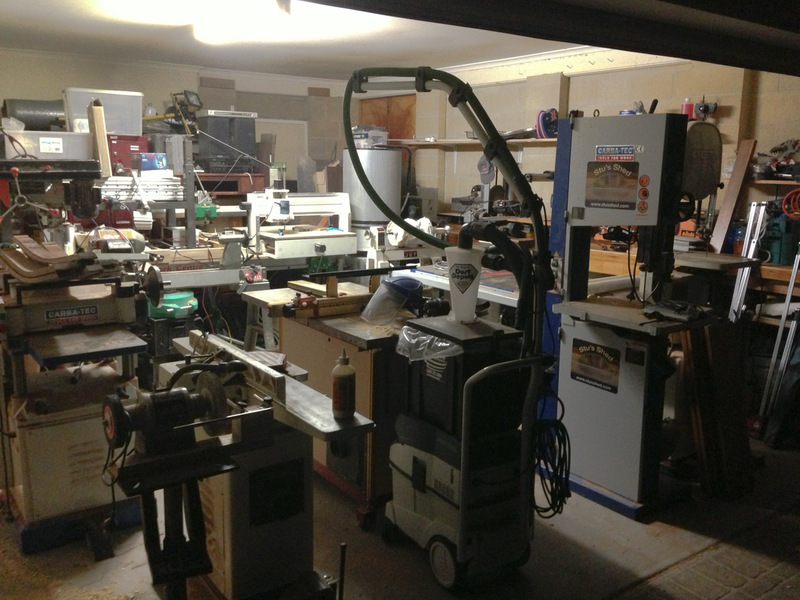 So it is a shed of sorts – not able to handle large materials, but I can access each of the machines in there – the tablesaw, router table, jointer, thicknesser, both bandsaws, drill press, CNC (while I still have it), the lathes, and even the benchtop machines – there is an existing workbench along one wall in the garage. Sure it is all a compromise, but hey – anything beats the last 5 months! The thicknesser and tablesaw can only be run off the generator – no 15A power available otherwise. Tomorrow I might even get to make some sawdust. Exciting! 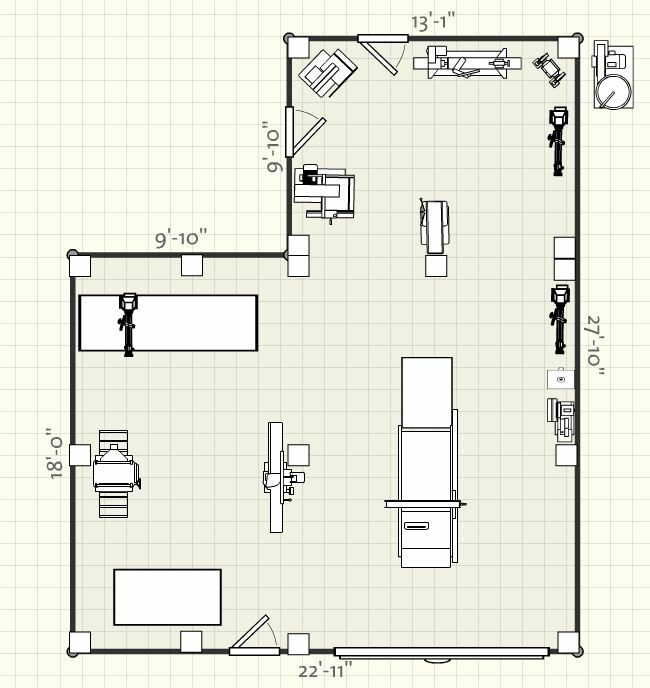 Going to throw it out there – if you are interested in helping me design the shed layout, I’d be most interested in your ideas! 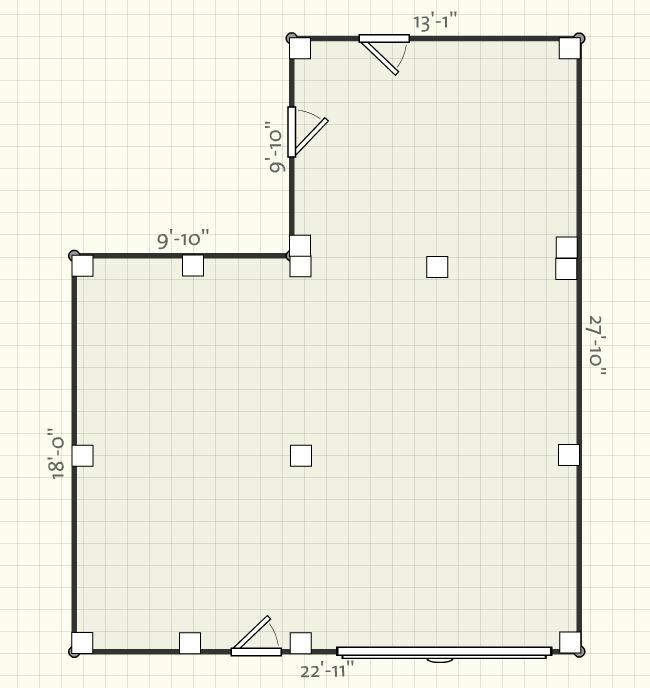 To start, these are the shed dimensions. The location of the roller door is pretty much fixed (won’t fit anywhere else), but all other doors and window can be shifted at this stage. There needs to be one door accessing the rear triangular area, and I do want a door accessing the back of the shed. Inside, there are columns to compete with, which are fixed in place. The slab design shows a pillar directly in the middle of the roller door, but I am doubting that is actually needed! Pretty pointless if it is – if this shed was for a vehicle, you’d have to split the car (or boat) in two to get it inside! The door in the 9’10” wall only needs to be in one of the two 9’10” walls, move as suitable! 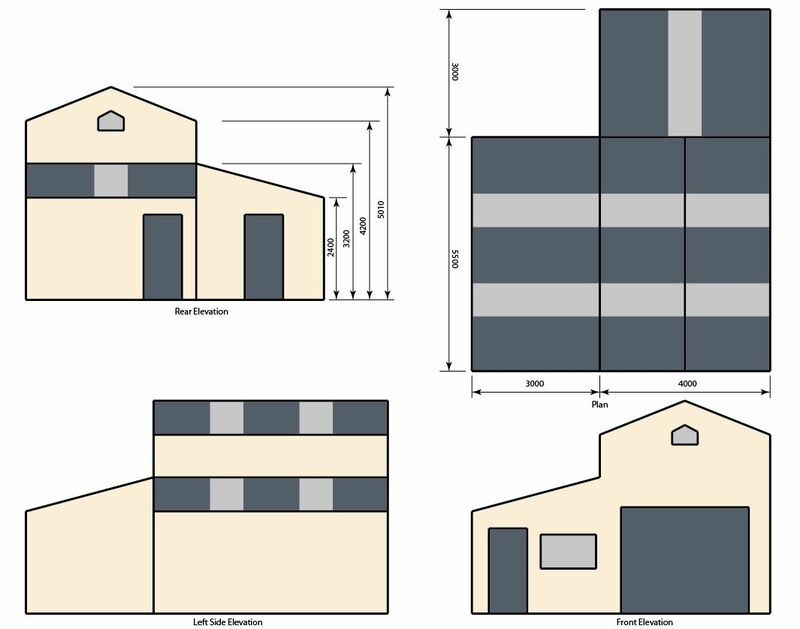 I’ve been using the Grizzly Shed Designer website – if you know of something better, I’d be keen to hear! This is one design I have come up with, but I’m sure it isn’t as good as it could be. So some specifics. The tablesaw is the TS10L (discontinued), and has a long wing on the right. It needs in and outfeed, but also room to the lefthand side for long items (at least until I get a Kapex). There is a router table which is about 680mm wide, and 1000mm long. Infeed and outfeed is across the shorter width, as the Incra LS Positioner extends down the length. There is a workbench – 1500×800, and the Torque Workcentre 2500×800 (the lathe on top of the workbench represents the overhead arm). 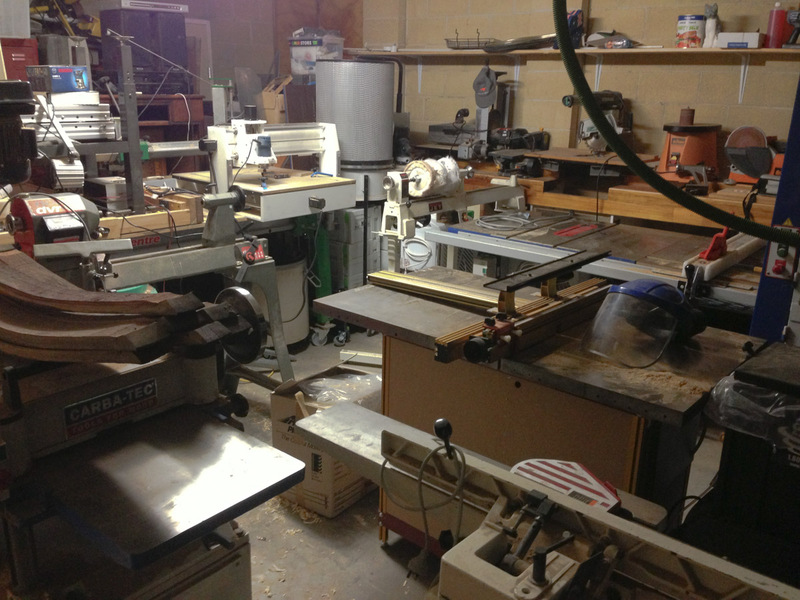 A 15″ thicknesser, a 6″ longbed jointer, a drill press. There are 2 bandsaws, one a 17″ Carbatec which is used for resawing, and a 14″ Jet for small items (no outfeed required). A Triton spindle sander, and a disk sander/linisher. There are three lathes showing. One is the DVR XP, one is the Nova Comet II, and the third is a Jet Mini, but this one will be used to hold three buffing wheels, so is part of the sanding section. As far as the rest, I’m not showing any timber storage as it will either be on the mezzanine, or stored elsewhere. The dust extractor and air compressor will be in a nearby shed, and can either be located in the triangular section (top left), or at the back, or alongside the shed at the right – your choice. I’m not showing any storage at the moment – either suggest what you will, or have a look at older photos of the workshop to see what I have been using in the past. So that’s the general scope – questions to refine the issues welcome. Hope someone can come up with a plan that really works!